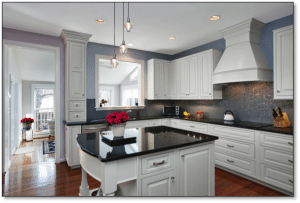 Lighting in your kitchen is often a main focal point, given the many shapes, sizes, and colors they come in. 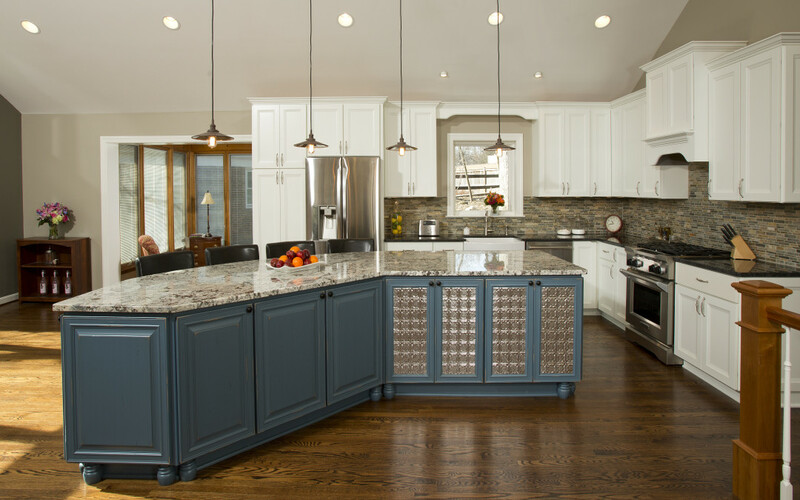 Pendant lights and lantern style fixtures continue to be a design trend in lighting, along with smaller lit areas of interest such as cabinetry and shelf lighting. Pendant lights continue to be popular as they come in so many varied shapes and sizes, and can be used independently, or in collections – whether linear or rhythmic. 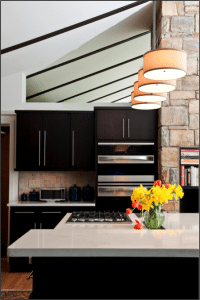 You can also vary the hight and shapes of your pendant lights giving your kitchen space more depth and complexity. Many people are forgoing traditional smaller pendants and opting to use a pair of larger chandelier or lantern style fixtures. If placed over an island, these are usually in sets of two. 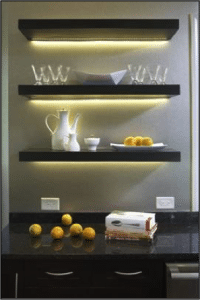 Cabinet and shelf lighting highlights items of interest for display. 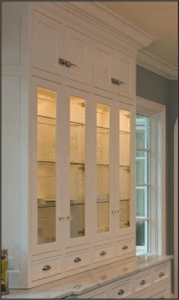 The best way to make the most of your in-cabinet lights is to pair them with glass shelves and doors, so the display items are highlighted throughout the space. Under cabinet lighting can be used as ambiance and accent, but also as task lighting for your workspace. Technology is making its way into all areas of the home, helping to keep us connected to the world around us. 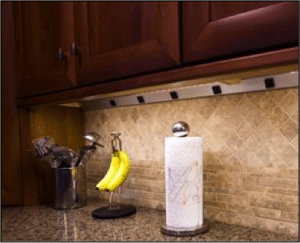 Plug molds, outlets on a strip, are used to allow your backsplash pattern to keep a steady flow without having the interruption of an outlet in the middle of the backsplash. Keeping with code, they also give you a larger span across your counter space for plugging items in. 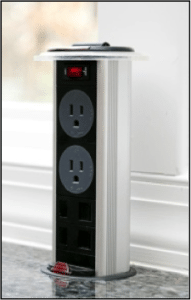 A pop-up outlet is another option for kitchen counters, particularly on islands, giving you the option to tuck the outlet away into the counter space when not in use. Keeping the Internet close at hand is a great way to have access to recipes and news through a tablet device without needing a TV or computer in your kitchen space. 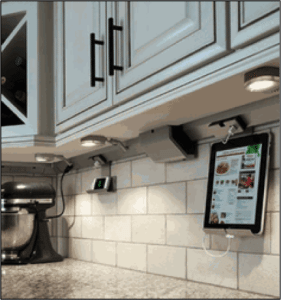 This homeowner chose to have a mount for their tablet, an elevated charging station for their phone, and a built-in speaker for the devices. With the increased technology in our lives, many clients are looking for organized ways to disconnect and charge their devices in a common area without cluttering the space. Check out other Kitchen and Bath Trends here!